The Korg DRV-3000 can be used in virtually any music situation where high-performance sound processing is required, and is particularly suited to MIDI applications. The Korg DRV-3000 offers you an enormous range of new sound worlds. Enjoy to the full the creativity offered by this versatile and exciting unit! The Korg DRV-3000 provides 16 sound-processing effects, including Five reverb effects, two early reflection effects and two echo effects. Also included are several special effects such as flange, chorus, ensemble, pan and two pitch shift effects, plus a parametric eq/driver effect. All these effects are stereo, and can be applied to a stereo or mono input. On the Korg DRV-3000, two different effects are used together, to create a “Program”. 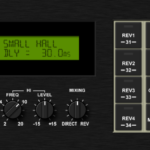 The Korg DRV-3000 features a range of 32 factory-preset programs. Effects can be edited (modified) by altering their ‘Parameters’ – the individual functions which when combined make up the overall effect. You can select two effects, edit them and combine them to make a program in two ways. ‘In serial” means the input signal is “Split” into two signals which are routed to each effect separately. “In parallel” means the input signal is processed by effect 1, and this processed signal is again processed by effect 2. 32 new programs can be created and stored in the same locations as the preset programs. However, the first 16 preset programs can always be recalled. The Korg DRV-3000 is operated via a handy wireless remote control unit, allowing instant selection of all effects and programs, as well as level changes, effect cancel and parameter editing. You can also select programs from an external midi keyboard or sequencer-handy for onstage situations when you need to instantly select the right program for your keyboard sound. All programs can be assigned to a midi program number corresponding to a voice on your keyboard. A midi keyboard can also be used to set the amount of pitch shift, in effects 15 and 16. An optional pedal switch can be used to switch the reverb time to a second, pre-programmed setting, and also to cancel the effect or select programs. Again, this is ideal in a live situation where your hands are occupied. Two pairs of output connectors (processing out 1 and 2 ) allow the Korg DRV-3000 to be used for “Surround sound” effects. When you use a stereo input you can send the direct signal to one pair of speakers, and a mix (which can be varied) of direct/processed sound to another pair.